Last week we wrote that the Sony Tablet S was on sale in Germany. Now you can get your hands on it at Best Buy for those of you in the US even though you can’t take it out of the shop until Friday. On September 16 you will be able to finally get this game lovers dream tablet which is Sony Play Station certified. 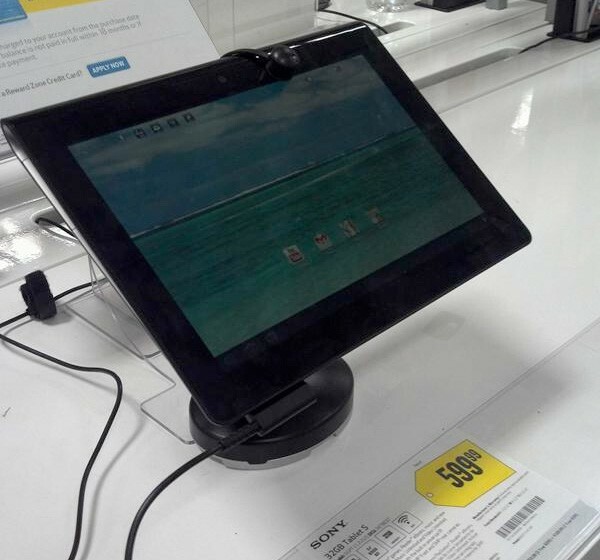 If you are lucky you can see it at your local Best Buy store. The pre-order price for the 16GB Wi-Fi version at Best Buy is $499.99 (link) and the 32GB Wi-Fi version will set you back $599.99 (link). It is a 9.4″ tablet running Android 3.1 Honeycomb.Additionally it gives you the gaming speed of the NVIDIA Tegra 2 processor with DLNA functionality. Though the 16GB Sony Tablet S can already be ordered at HSN for $599.99. I recommend waiting to Friday and saving yourself a Ben Franklin.